The post Most common jobs in the US - a small multiples comparison appeared first on SAS Learning Post. We can't rewind, we've gone too far. "You kids have it easy," my father used to tell me. "When I was a kid, I didn't have all the conveniences you have today." He's right, and I could say the same thing to my kids, especially about today's handheld technology. In particular, I've noticed that powerful handheld technology (especially the modern calculator) has killed the standard probability tables that were once ubiquitous in introductory statistics textbooks. In my first probability and statistics course, I constantly referenced the 23 statistical tables (which occupied 44 pages!) in the appendix of my undergraduate textbook. Any time I needed to compute a probability or test a hypothesis, I would flip to a table of probabilities for the normal, t, chi-square, or F distribution and use it to compute a probability (area) or quantile (critical value). If the value I needed wasn't tabulated, I had to manually perform linear interpolation from two tabulated values. I had no choice: my calculator did not have support for these advanced functions. In contrast, kids today have it easy! When my son took AP statistics in high school, his handheld calculator (a TI-84, which costs about $100) could compute the PDF, CDF, and quantiles of all the important probability distributions. Consequently, his textbook did not include an appendix of statistical tables. It makes sense that publishers would choose to omit these tables, just as my own high school textbooks excluded the trig and logarithm tables that were prevalent in my father's youth. When handheld technology can reproduce all the numbers in a table, why waste the ink and paper? In fact, by using SAS software, you can generate and display a statistical table with only a few statements. To illustrate this, let's use SAS to generate two common statistical tables: a normal probability table and a table of critical values for the chi-square statistic. A normal probability table gives an area under the standard normal density curve. As discussed in a Wikipedia article about the standard normal table, there are three equivalent kinds of tables, but I will use SAS to produce the first table on the list. 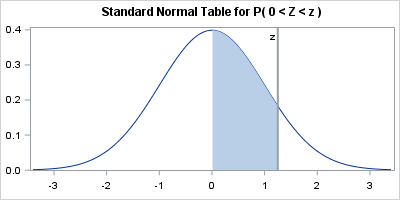 Given a standardized z-score, z > 0, the table gives the probability that a standard normal random variate is in the interval (0, z). 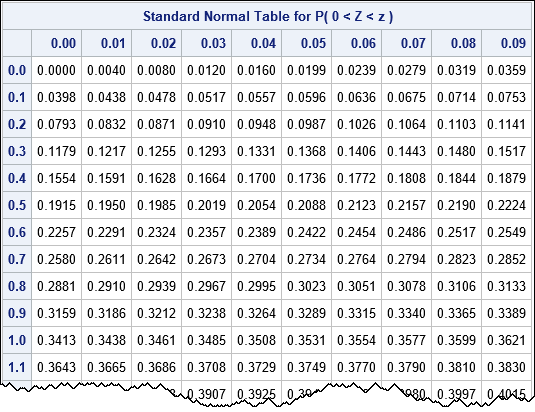 That is, the table gives P(0 < Z < z) for a standard normal random variable Z. The graph below shows the shaded area that is given in the body of the table. You can create the table by using the SAS DATA step, but I'll use SAS/IML software. 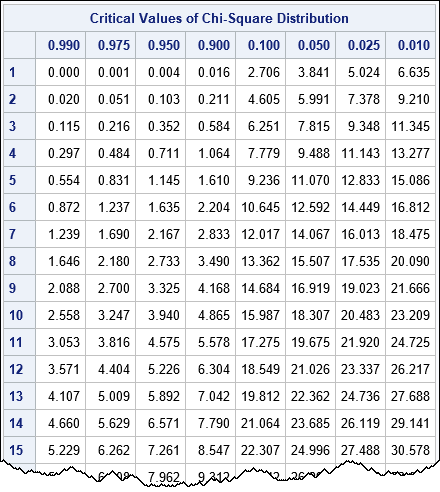 The rows of the table indicate the z-score to the first decimal place. The columns of the table indicate the second decimal place of the z-score. The key to creating the table is to recall that you can call any Base SAS function from SAS/IML, and you can use vectors of parameters. In particular, the following statements use the EXPANDGRID function to generate all two-decimal z-scores in the range [0, 3.4]. The program then calls the CDF function to evaluate the probability P(Z < z) and subtracts 1/2 to obtain the probability P(0 < Z < z). The SHAPE function reshapes the vector of probabilities into a 10-column table. Finally, the PUTN function converts the column and row headers into character values that are printed at the top and side of the table. To find the probability between 0 and z=0.67, find the row for z=0.6 and then move over to the column labeled 0.07. The value of that cell is P(0 < Z < 0.67) = 0.2486. Some statistical tables display critical values for a test statistic instead of probabilities. 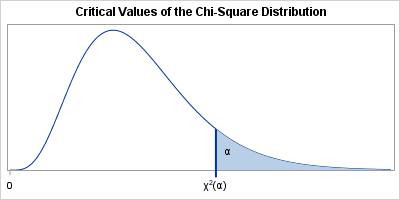 This section shows how to construct a table of the critical values of a chi-square test statistic for common significance levels (α). The rows of the table correspond to degrees of freedom; the columns correspond to significance levels. The following graph shows the situation. The shaded area corresponds to significance levels. To illustrate how to use the table, suppose that you have computed a chi-square test statistic for 9 degrees of freedom. You want to determine if you should reject the (one-sided) null hypothesis at the α = 0.05 significance level. You trace down the table to the row for df=9 and then trace over to the column for 0.05. The value in that cell is 16.919, so you would reject the null hypothesis if your test statistic exceeds that critical value. Just as digital downloads of songs have supplanted records and CDs, so, too, have modern handheld calculators replaced the statistical tables that used to feature prominently in introductory statistics courses. However, if you ever feel nostalgic for the days of yore, you can easily resurrect your favorite table by writing a few lines of SAS code. To be sure, there are some advanced tables (the Kolmogorov-Smirnov test comes to mind) that have not yet been replaced by a calculator key, but the simple tables are dead. Killed by the calculator. It might be ill to speak of the dead, but I say, "good riddance"; I never liked using tables those tables anyway. What are your thoughts? If you are old enough to remember tables do you have fond memories of using them? If you learned statistics recently, are you surprised that tables were once so prevalent? Share your experiences by leaving a comment. The post Calculators killed the standard statistical table appeared first on The DO Loop. Avoid frustrations by following these 5 tips from David Loshin to create a successful data management strategy for analytics. The post Data management strategy for analytics appeared first on The Data Roundtable. Data density estimation is often used in statistical analysis as well as in data mining and machine learning. Visualization of data density estimation will show the data’s characteristics like distribution, skewness and modality, etc. The most widely-used visualizations people used for data density are boxplot, histogram, kernel density estimates, and some other plots. SAS has several procedures that can create such plots. 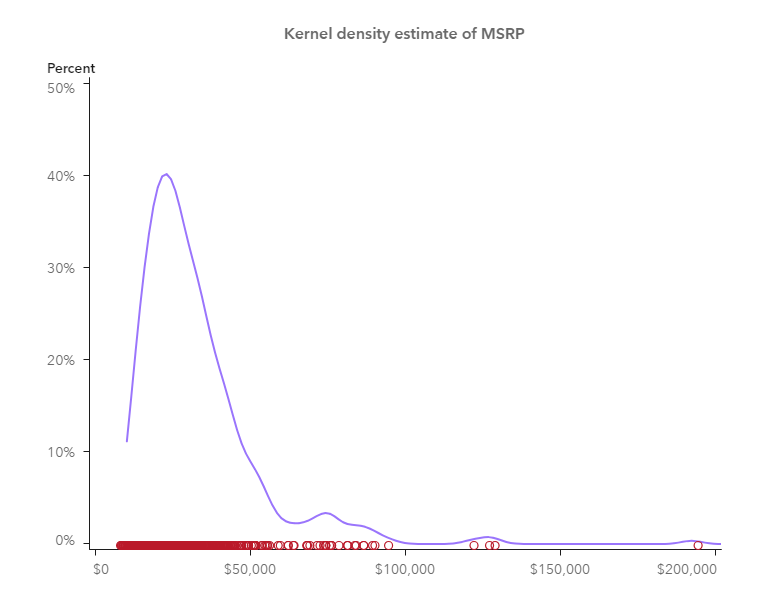 Here, I'll visualize the kernel density estimates superimposing on histogram using SAS Visual Analytics. 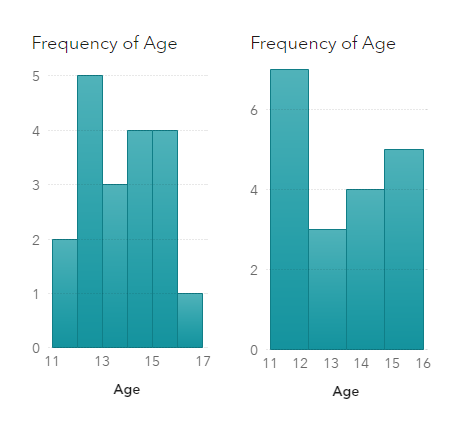 A histogram shows the data distribution through some continuous interval bins, and it is a very useful visualization to present the data distribution. With a histogram, we can get a rough view of the density of the values distribution. However, the bin width (or number of bins) has significant impact to the shape of a histogram and thus gives different impressions to viewers. For example, we have same data for the two below histograms, the left one with 6 bins and the right one with 4 bins. Different bin width shows different distribution for same data. In addition, histogram is not smooth enough to visually compare with the mathematical density models. 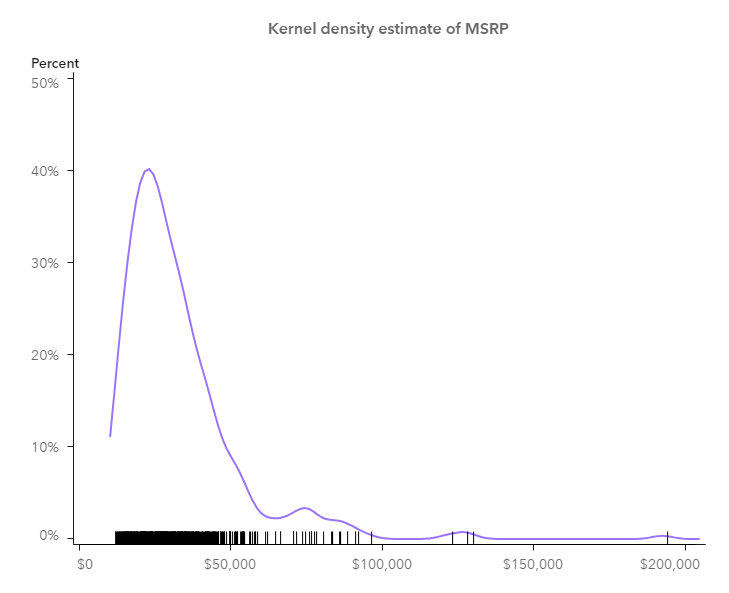 Thus, many people use kernel density estimates which looks more smoothly varying in the distribution. 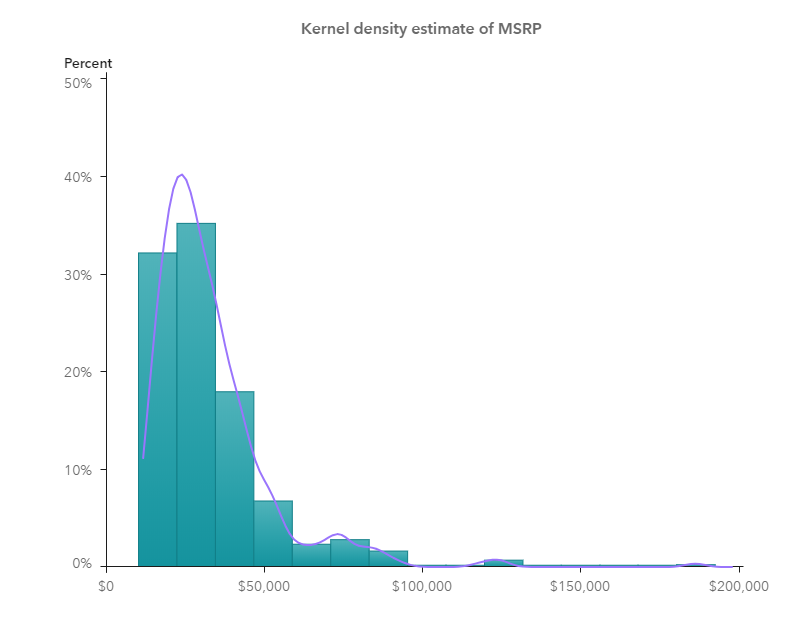 Kernel density estimates (KDE) is a widely-used non-parametric approach of estimating the probability density of a random variable. Non-parametric means the estimation adjusts to the observations in the data, and it is more flexible than parametric estimation. To plot KDE, we need to choose the kernel function and its bandwidth. Kernel function is used to compute kernel density estimates. Bandwidth controls the smoothness of KDE plot, which is essentially the width of the sliding window used to generate the density. SAS offers several ways to generate the kernel density estimates. Here I use the Proc UNIVARIATE to create KDE output as an example (for simplicity, I set c = SJPI to have SAS select the bandwidth by using the Sheather-Jones plug-in method), then make the corresponding visualization in SAS Visual Analytics. Run above code in SAS Studio, and we get following graph. In SAS Visual Analytics, load the SASHELP.CARS and the KDE dataset (from previous Proc UNIVARIATE) to the CAS server. Drag and drop a ‘Precision Container’ in the canvas, and put a histogram and a numeric series plot in the container. Histogram -> Bin range: Measure values; check the ‘Set a fixed bin count’ and set ‘Bin count’ to 15. Now we can start to overlay the two charts. As can be seen in the screenshot below, SAS Visual Analytics 8.3 provides a smart guide with precision container, which shows grids to help you align the objects in it. If you hold the ctrl button while dragging the numeric series plot to overlay the histogram, some fine grids displayed by the smart guide to help you with basic alignment. It is a little tricky though, to make the overlay precisely, you may fine tune the value of the Left/Top/Width/Height in the Layout of VA Options panel. The goal is to make the intersection of the axes coincides with each other. To go further, I make a KDE with a scatter plot where we can also get impression of the data density with those little circles; another KDE plot with a needle plot where the data density is also represented by the barcode-like lines. Both are created in similar ways as described in above histogram example. So far, I’ve shown you how I visualize KDE using SAS Visual Analytics. There are other approaches to visualize the kernel density estimates in SAS Visual Analytics, for example, you may create a custom graph in Graph Builder and import it into SAS Visual Analytics to do the visualization. Anyway, KDE is a good visualization in helping you understand more about your data. Why not give a try? 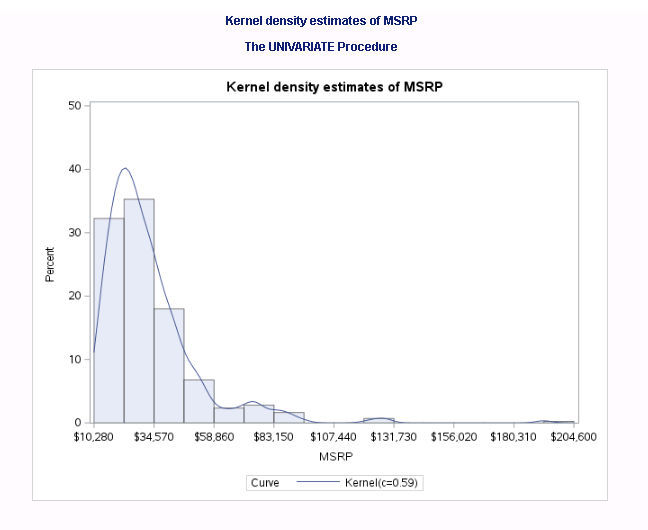 Visualizing kernel density estimates in SAS Visual Analytics was published on SAS Users. The post What are the most common occupations in each US state? appeared first on SAS Learning Post. For details of how individual permissions for both data and content are mapped from SAS 9.4 to SAS Viya see the documentation has great coverage of the steps to follow. 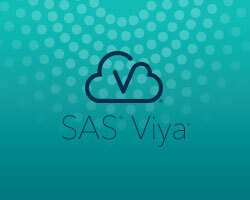 New functionality for transitioning from SAS Visual Analytics on 9.4 to SAS Viya was published on SAS Users.